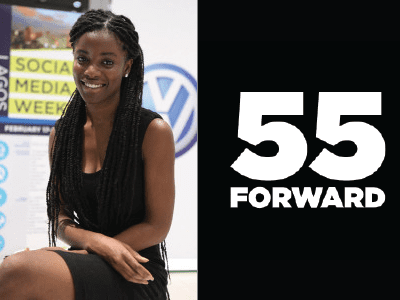 We’re proud of the #55FORWARD Ambassadors that gave time and energy to attend Social Media Week Lagos. We sat down with one of our ambassadors, Sharon Obuobi, executive director of African and Afro-Diasporan Art Talks. The organization facilitates conversations around art. The 22-year-old hails from Ghana and has lived in Canada, the U.S., the U.K. and France. She reflected with us on the power of social media to connect the diaspora, some places on the continent she wants to visit in the future and joked about her role in drumming up a Ghana-Nigeria rivalry. You’ve lived in many countries. How has that been an asset to your work? Well in today’s society with social media and the Internet we’re all connected, so wherever you are there are people that have a similar culture or background that you have. So in each place that I’ve lived I’ve been able to meet Africans in the diaspora or I’ve been able to find ways to connect with Africans. And it’s also given me a more open perspective on the world and my community in Ghana. So bringing that back to living in Ghana right now, I find that I’m more aware of different ways of doing things and its been a benefit. What are some similarities and some differences between your home country Ghana and Nigeria? It’s funny you ask this because it’s the number one thing I joke about with all my Nigerian friends. I say number one, Ghanaians are by far better than Nigerians in every single every thing (laughs). Even football? I will debate forever about this. Black Stars over the Eagles any day, all the time (laughing). But you said similarities. I would say we are very similar in our cultures our food and our language so it’s been very cool to be in Lagos for the first time and to see similarities in our lifestyles. Are there any other places in Africa that you really want to visit and see what’s going on as far as innovation or art? Definitely Dakar, Senegal and Morocco. I would want to see South Africa, Egypt and Algeria. Okay, so with the ‘even football’ quip it was really four questions. But you get the drift. We thank Sharon Obuobi for her time. Her work can be found at www.aadatart.com. You can also find her pages on Facebook, Instagram and Twitter.